The easiest way to create great beats. Rebuilt from the ground up with a simple objective. Make beatmaking Faster, Easier & More Fun. We think we achieved that. Use your own samples or load up an inbuilt kit. Portrait or Landscape. iPhone, iPod or iPad. Multiple color theme options to suit your style . Use the App the way you want. Want to share with your friends? You can. Want to share with the world? You can. Public or private, via Mail, Text Message, Facebook or Twitter. Entire pattern or just the audio, the choice is yours. New Effects Editor. Hands Free. The new x/y effects editor in EB3 comes complete with pattern based recording, allowing you to quickly add serious automation to your exported beats. The best interface. Just got better. Millions of users love EasyBeats&apos; unique interface. When you quickly copy & paste using the new zoomable editor, you will too. Easy for beginners. Features for Pros. 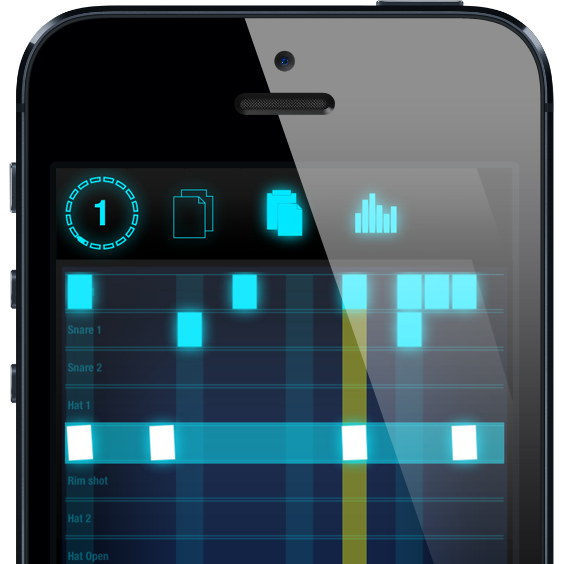 Sample cropping, Choke Groups, Adjustable Step Count, Adjustable Swing, MIDI Clock Sync, WAV Export, AudioCopy, WiST, AudioBus.